Here's an easy and fast weekend project - a small crochet butterfly. For the butterfly I used embroidery floss and a 1.7 mm hook. For the body cut a 1.50m of floss and double it. Row 1: sl st in the 2nd ch from hook, then hdc (7) across. Cut floss, tie a knot and weave it through the body. Insert floss in the 3 st of the body and ch3. In the next st, dc1, tr2. In the next st, tr1, dc1, ch 3 and sl st. Sl st in the next st and ch 3. In the next st dc2 and hdc1, ch2 and sl st (all in the same stitch). Ch 1 and (going below the body) insert the floss in the same st of the opposite side and work the above pattern backwards. 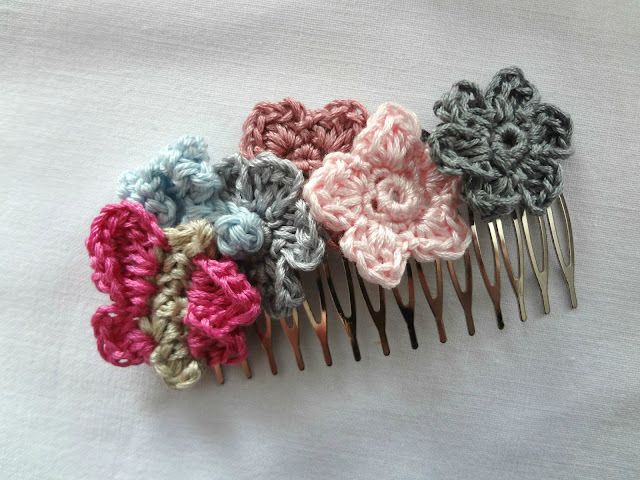 It can be used as applique for decoration or to make hairpins / hair combs with it. Enjoy it! So beautiful flower and butterfly appliques. Thank you so much for sharing your tutorial and patterns. Its such a cute butterfly and it reminds me that how long its been since I did some crochet. Hi Demi! Thank you for visiting and commenting! so cute thanks so much for the pattern! Your crochet work is beautiful Maya. Thanks for sharing the tutorial and pattern with us at C&C with J&J. Wishing you a happy new year and a wonderful week. What a lovely crocheted butterfly! Thank you for the pattern!! Oh how pretty. The little butterfly is adorable. Thank you so much Annemarie on the exciting feature!